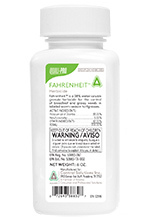 Fahrenheit™ herbicide contains two modes of action: Group 2 and Group 4. As a Group 2 herbicide, metsulfuron-methyl inhibits acetolactate synthase (ALS) responsible for the synthesis of essential amino acids that are necessary for plant growth. As a Group 4 herbicide, dicamba is a synthetic auxin that mimics the natural plant hormone indole acetic acid (IAA) causing rapid, abnormal cell growth further leading to a blockage of phloem vascular tissue. This combination is a very effective weed control tool.